There’s no denying Iceland is hot right now. From natural wonders to art and culture to a laid-back city center full of unique coffee shops and bars, this once-hidden gem is rapidly gaining popularity. And with WOW air offering low-cost flights from destinations across the U.S., it consistently tops lists of affordable flights to Europe. 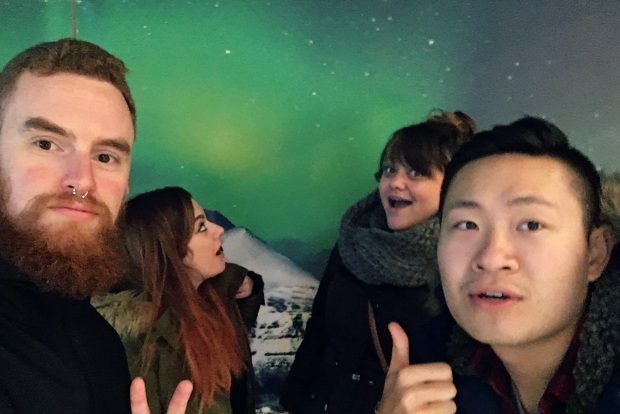 I booked my flight during a WOW air fare sale and paid $200 round-trip from Boston to Reykjavik for a December getaway. Of course, WOW is a no-frills airline, and you’ll pay extra for things like seat selection and baggage. 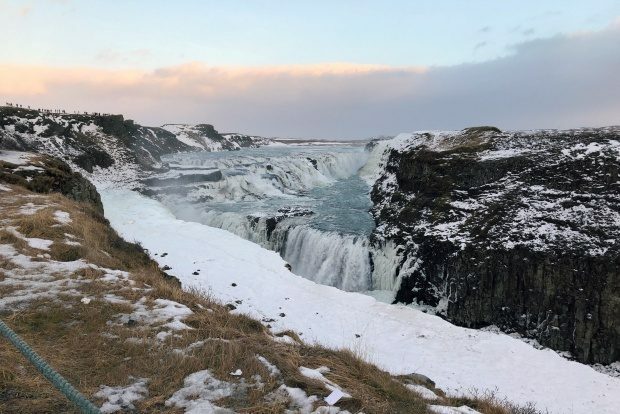 I managed to travel with only a backpack (a first for me, and surprisingly doable), but if you prefer a flight with a few amenities, deals can also be found with Icelandair. In fact, finding a flight is the easy part (you can compare your options on Cheapflights.com). With so much to do — and so many options for how to do it all — planning an Icelandic adventure can be a little daunting. Should you take day tours or rent a car? When and how do you see the northern lights? Do people really eat fermented shark? Read on for answers to these questions and more as I break down the 12 things I wish I knew before I visited Iceland. Hallgrimskirkja is the tallest building in the area by far, making it an easy way to orient yourself. When looking for accommodations, the options may seem overwhelming. Whether you choose a hotel, hostel or apartment is a personal preference, but be particular when choosing the neighborhood. 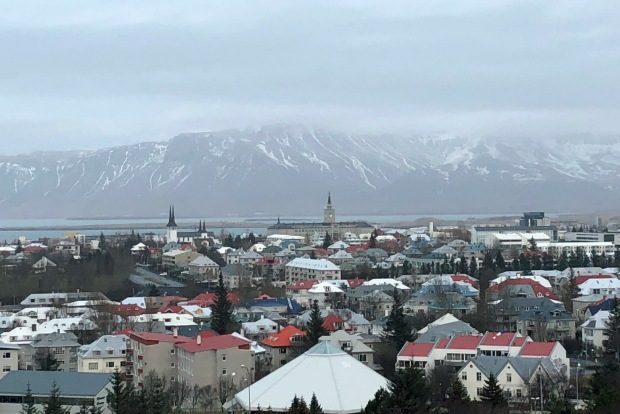 If you’re planning on exploring downtown Reykjavik and are excited to check out the city, stay in the Miðborg neighborhood (also more easily referenced as the 101). While there are other neighborhoods nearby that are walkable — Vesturbær (the 107) or Hlíðar (the 105) — distances can be deceiving and it may be a 30 minute walk to the city center, which can feel longer in winter weather. We chose an Airbnb in the 101 neighborhood, which provided the best of both worlds. It was located on a residential side street, but was a quick 5 minute walk to shops, restaurants, bakeries and bars. If you settle on accommodations in the 101, use Hallgrimskirkja to orient yourself. The church is one of the tallest structures in Iceland and can be easily found from much of the downtown area. It’s also a convenient place to park and meet tour groups or transportation if you’re not staying at a hotel. Don’t miss Gulfoss waterfall on the Golden Circle route. Driving in a foreign country may seem intimidating, but don’t immediately go the organized tour route without weighing your options. A car affords you the opportunity to make your own schedule, see the sights you want to see and skip the ones you don’t. It also allows you to plan around the weather and change your itinerary on the fly. And, if you’re traveling in a group and one or more of you is comfortable driving in all types of weather, splitting a rental car may even be cheaper than taking multiple organized tours. In my group, I was not one of the drivers, and was originally a bit skeptical about driving after reading a few articles about winter road conditions. However, if most of your exploring is going to be to tourist-heavy areas (like the Golden Circle route), the roads are well traveled even in winter. Keep in mind, winter days are shorter, so daylight driving hours are limited. That said, summer will yield plenty of sun. If you’re planning on going a bit off the beaten path or setting out on longer day trips, there are some precautions you can and should take. Be sure at least one person you’re traveling with has an international data plan and pack an extra phone battery. Bring a paper map along, since GPS can often be unreliable. Bookmark Road.is for information on road closures and driving conditions by region. Pack water and snacks in case you get stuck or the ride becomes longer than anticipated. Download the 112 app (112 is the 911 of Iceland). File your route with safetravel.is. We limited ourselves to the Golden Circle area, but still did the above for extra peace of mind. It’s a big loop and highly trafficked by tourists and tour groups alike. Each stop is well marked and offers restrooms, and often snacks and gift shops. The fine print of your rental car insurance is always important to consider, but especially so when traveling in Iceland. Depending on what type of driving you plan to do and the time of year you’re traveling, what you need could be different. You’ll hear the words “sand and ash insurance” a lot, and having the insurance can save you thousands of dollars if you happen to need it. That said, whether or not you’ll need it is typically predictable via weather conditions, and, if you avoid driving in high winds or storms, you may be okay. That said, peace of mind may be worth the cost. If you’re concerned about the parking situation, don’t be. Free parking isn’t hard to find in downtown Reykjavik. It’s always free by Hallgrimskirkja church and throughout the downtown area all day on Sunday. You can also find free street parking downtown from 6 p.m. to 9 a.m. on weekdays — and given you’ll be spending most of the day on the road, this is more than sufficient. Meeting the locals is out of this world. Start your day with a coffee at this eclectic and cozy coffee shop, packed with charm and homey kitsch. But before you go, be sure to use the unisex bathroom where you’ll be transported to a galaxy far, far away. 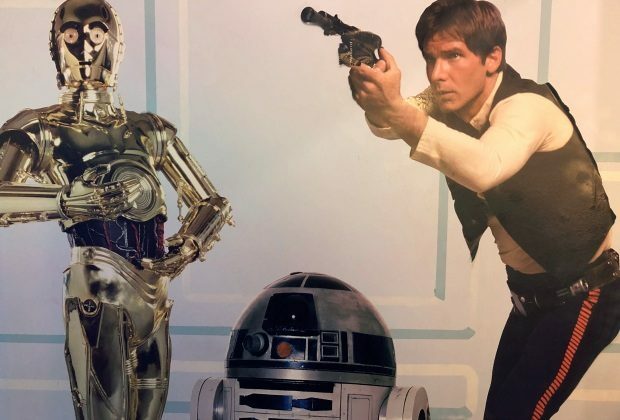 Luke, Leia and Han adorn the walls, along with R2D2 and C3PO, and the musical styling of the “Star Wars” theme song make the whole experience feel a bit more epic. Do as the locals do and try hakarl with a shot of Brennivin. 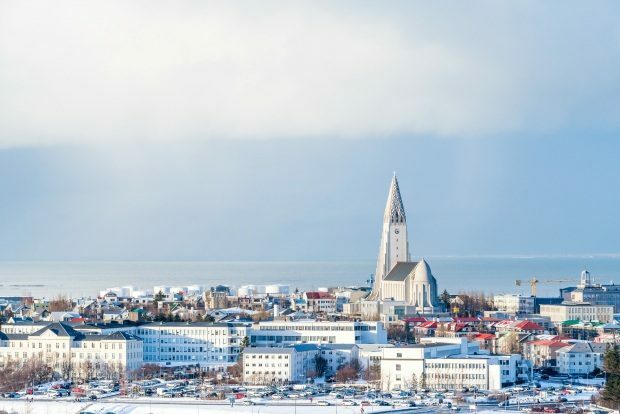 Cheap flights aside, Reykjavik is a pricey city. At the time of publishing, $1 equals approximately 104 Icelandic Krona. And, even as someone who doesn’t mind a vacation splurge, it is noticeably expensive. A fast food value meal at local chain Aktu Taktu set me back $25. While a country like Iceland is 100% worth the trip, saving money when possible is obviously preferable, and one way you can save a significant amount is on food. If you’re staying in an apartment or other accommodation with access to a kitchen, dine in to save money. You can have an incredibly authentic experience by shopping in an Icelandic grocery store and doing your own cooking. Discount grocery chain Bonus (the bright yellow color and pig logo will give it away, and there’s one right in downtown Reykjavik) is the place to start. We were enthusiastically referred there by multiple locals, and made a number of trips there over the course of our stay. If you’re hoping to try Icelandic delicacies, skip high-priced restaurant versions and give them a try on your own. 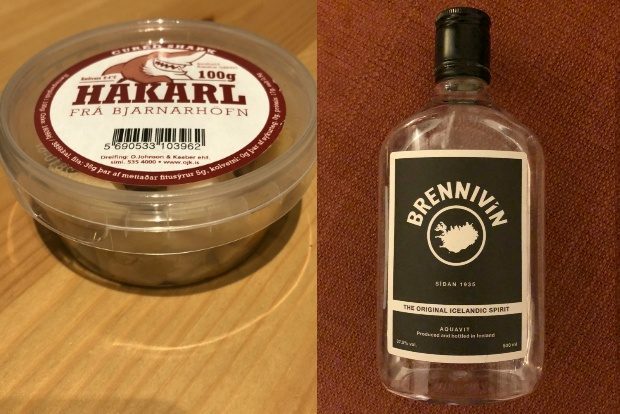 A go-to combo: Hakarl (fermented shark) chased with a shot of Brennivin (an Icelandic schnapps flavored with caraway seeds). Anthony Bourdain said the dish was one of the worst things he’s ever tasted. But I did it and it wasn’t so bad. Or maybe it was. Either way, I tried it and you should too. Iceland isn’t particularly known for its cuisine, so you won’t miss a lot by eating in. But if there’s a type of Icelandic food you’re itching to try, enjoy one meal out. We thoroughly enjoyed the lobster soup (called humarsupa) at Saegreifinn (The Sea Baron). The small, informal restaurant is right by the water in Reykjavik harbor and also offers a variety of fresh fish, as well as local specialties. We were all able to try a sample-sized piece of minke whale meat while we were there. Spoiler alert, it tasted like fishy steak and while I enjoyed trying it I was grateful for the sample-sized portion. Other delicacies like hakarl and cormorant (a local sea bird) are also on offer. Also, grab a cheap and incredibly tasty hot dog at one of the Baejarins Beztu Pylsur stands around town for a quick lunch. Order it with the works and they’ll load it up with ketchup, sweet mustard, fried onion, raw onion and remoulade. The Appy Hour app tells you where and when specials are happening in real time. We were able to take advantage of $5 beers and do a bit of bar hopping while we were at it. The bar scene is eclectic and easy to navigate, with so many unique bars within walking distance, from English pubs to sleek lounges to bars influenced by American pop culture. Boston – Being from Boston, stopping in for a beer at this unassuming bar was a no brainer, but it ended up being our favorite watering hole. Not only did it offer the best happy hour deal we came across, but the staff was friendly and the cozy back patio, where we posted up on multiple occasions, was adorned with lights and heat lamps. Kaffe Vinyl – This laid-back lounge doubles as a record store and has a chill vibe, comfortable seating and great music. 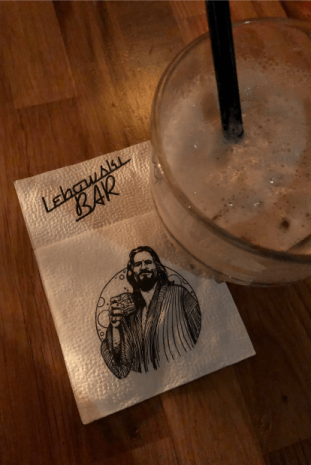 Lebowski Bar – Of all the bars on the list, this was by far the most touristy, but if you’re a fan of the film (or just really like White Russians), Lebowski Bar is worth the trip. White Russian happy hour is 4-7 p.m. and there are more than 20 options on the menu. The decor is also on theme, and really ties the room together. Kaffibarinn – Recognizable from the London tube sign over the door, the interior is warm and homey and it’s a great place to enjoy a pint tucked away in a corner. Have a late afternoon beer around one of the cozy tables and recap the adventures of the day or prep for your night out. 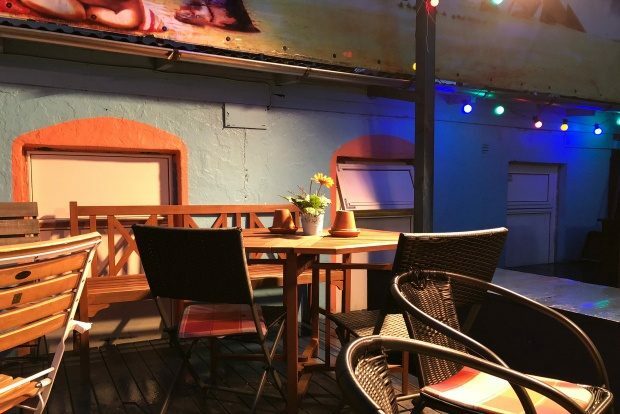 Bar Ananas – We were sold immediately on the kitschy tiki theme of this beach bar that appears to have been teleported over from a tropical locale. A drink or 2 here will make you forget you’re in Iceland in the middle of winter. If you forget, you can always head to Boston’s year-round patio. Win win. If you want a glass of wine with dinner or would like to get a head start before heading out for the night, plan accordingly as liquor stores close earlier than you may expect (typically around 6 p.m.) and are closed on Sunday. Better yet, stock up at duty free to save. Buy a bottle of Brennivin and some local beer (or anything you like) before leaving the airport. Pro tip: Small airplane-sized bottles are also a great way to try different flavors of local liquor. Give birch liqueur a try (there’s even a little birch twig inside the bottle). 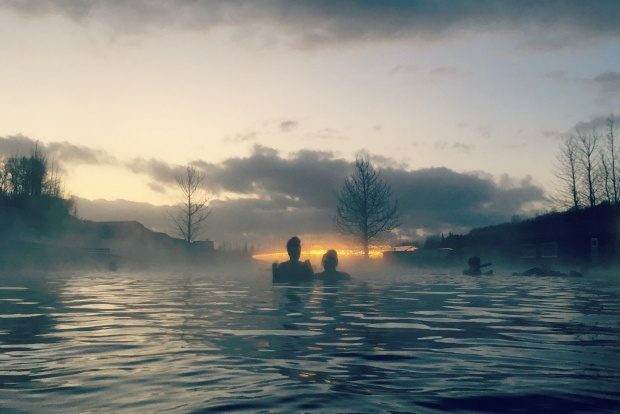 End a day of exploring the Golden Circle at the Secret Lagoon. Don’t get me wrong, the Secret Lagoon is a great way to cap off a day of sightseeing, but half a moniker is all these 2 bodies of water have in common. 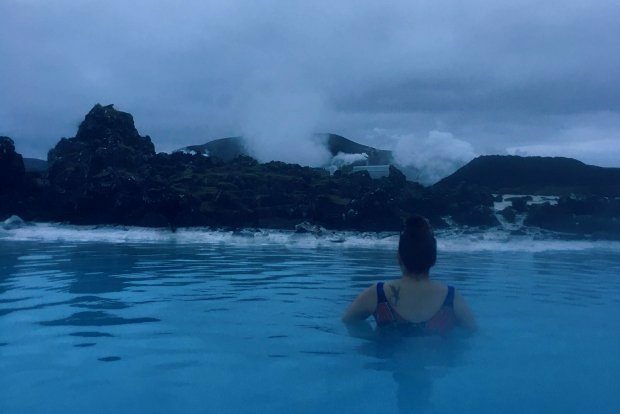 While some will offer up the advice that visiting the Secret Lagoon instead of the Blue Lagoon is a way to save money, take this advice with a grain of salt — they are two wholly different experiences. The Secret Lagoon is fed by natural hot springs and is quite small, making it a scenic and intimate experience that can be incredibly soothing after a long day of sightseeing. That said, the Blue Lagoon is not natural — it’s a massive man-made pool fed by silica-rich runoff from a geothermal plant nearby — and feels a bit otherworldly. While not cheap, it’s the type of once-in-a-lifetime experience that’s worth the price. While unequivocally touristy, you can curb the overcrowded feel by going early. If you’re part of the first group in, you’ll have some time where you can find a hidden corner and feel quite removed. It you visit in the winter, early morning entry will also mean it’s still dark out and you’ll have the perk of seeing the sun rise. Early entry is also a way to stretch your dollar, since there is no limit to time allowed in the lagoon, so you can stay and play as long as you’d like. Food is pricey inside, so pack a quick snack if you’re going to be there during meal times. Don’t miss the Blue Lagoon. While you can pop into the Secret Lagoon without a reservation, the Blue Lagoon requires tickets purchased in advance. Reserve yours as soon as you book your flights, especially if you’re looking to go on a weekend. The smartest way to plan your visit is on the way to or from the airport, since it’s located conveniently between Keflavik Airport and Reykjavik. But coordinating your lagoon visit with your flight time also means less flexibility on when you’ll want to enter the lagoon. Booking early will give you a better chance of getting your preferred time. You can conveniently book bus transfers between Reykjavik, the Blue Lagoon and the airport with your entrance ticket for an added charge. But be sure to double check pick-up times if you need to make it to airport on a schedule. While they advertise the transfers as hourly, when we tried for the 1 p.m. we were told the next bus was at 2 p.m. We ended up taking a cab to the airport to avoid running late, and it was another easy option (although the cab was $70). So if you’re on a schedule, just confirm with someone at the lagoon or bus company what time your bus will be there. The high level of silica in the water is amazing for your skin, but terrible for your hair. If you have long hair, tie it up and don’t go underwater. There’s conditioner in ever shower stall (you have to shower before you go in), and it’s recommended that you coat your freshly-washed hair in conditioner and leave it on while in the lagoon. I coated my hair and put it in a bun, and it was in great condition afterwards, but a quick Google search will bring up a mass of horror stories from people who didn’t. That said, the free silica face masks included with admission are wonderful for your skin, and are available at a swim-up bar within the lagoon. Definitely take advantage. If you wear contact lenses, you may also want to keep your head above water as the silica can be incredibly irritating. While it’s advised that you take your lenses out before entering the lagoon, wearing glasses in a steamy body of water is also not ideal. As someone with poor vision who relies on contact lenses, taking them out wasn’t a viable option. I wore them in and I was fine (as were a number of other travelers I spoke with). That said, this may not be the case for everyone. You can get in and out of the locker room as you please, so there’s really no harm in wearing your contacts in and removing them if you experience any discomfort. The Perlan observation deck provides 360 degree views, including the photogenic Reykjavik rooftops. While nearly everything in Iceland is as photogenic as it comes, there are some classic shots you may want for your memories (and Instagram). Wondering where to go for the iconic view of Reykjavik’s colorful rooftops? For a close-up view, head to the top of Hallgrimskirkja. The open-air platform at the top of the nearly 250-foot tall structure is accessible mostly by elevator and costs around $9 for adults. The tower closes at 4:30 p.m. in the winter (8:30 p.m. in summer). You can also get great 360 degree city views a bit farther away from the observation deck at the Perlan Museum. It’s less than $5 to enter and is open a bit later for winter travelers (it closes at 7 p.m. daily). For those traveling without a car, there’s a free shuttle from Harpa Concert Hall downtown. If you’re staying in downtown Reykjavik, eye-catching street art is everywhere, so be on the lookout. The northern lights forecast was a 1 out of 9 while we were there, so we settled for this backdrop at Perlan. And I’m not talking only about the weather. If you’re in Iceland during the winter months, chances are the northern lights are on your list. Your likelihood of seeing them depends on a number of factors, but if you’re not technical, they make it quite easy by rating your chances nightly on on the Kp-index (which is a 1-9 scale). The Icelandic Meteorological Office offers reliable aurora forecasts that you can consult while on your trip to gauge whether that tour or drive is worth it. If the rating is a 1 or 2 (as it was when we were there), you’re chances are incredibly slim, but with a 5-6, you have a better chance. Only in Iceland for a quick stopover? Check out our 8-hour Reykjavik stopover guide, and start planning your first Iceland adventure on Cheapflights.com. Already been? Share any tips we missed in the comments.